Mention Harbin and the image that comes quickest to mind is that of its annual ice festival, a stunning display of life-sized ice sculptures and snow carvings. But this north-eastern Chinese city has much to offer in summer too. For a start, there is the warm, balmy weather, with temperatures crossing 25 deg C or more in the day - a stark contrast to the freezing minus 30 deg C (or lower) that you get in winter. That means you can take time to soak in the city's distinctively Russian vibe, meander down its European-looking Central Street and watch enthusiastic locals practise their dance moves at Stalin Park, a strip of shady walkways running alongside the broad Songhua River. Dancing? Yes, the provincial capital of Heilongjiang, China's northernmost province bordering Siberia, is not just known as Ice City, but it has also been recognised by Unesco as "Music City", for being the birthplace of China's oldest symphony orchestra and first music school, as well as for hosting the long-running Harbin Summer Music Concert every two years. It probably explains the presence of the alien-looking Harbin Opera House, a curvy steel structure rising from the reeds on the banks of the Songhua River. Just 6km from the city centre, it dominates the wetlands that the local government is turning into an arts hub. But you can also tell the city's love of music and art on the streets. Along Zhongyang Dajie (Central Street), you can catch musicians entertaining shoppers with their saxophones or violins, artists sketching portraits of customers and ballroom dancers waltzing across a square every evening. In the mornings, more dancers can be seen near the Flood Control Monument trying out somewhat flirtatious moves from a Central Asian folksy dance, to upbeat music that sounds suspiciously like bhangra. Most of the dancers, you might notice, are generally older. "It's good for the retirees," says a local Harbin resident. "If they don't have to take care of their grandkids, this is a good way to keep active. They're here in winter too - it's not cold if you keep moving." Altogether, it is a scene quite unlike what you might expect from a Chinese city. Then again, Harbin is not quite a Chinese city. Founded in 1898 by Russians as a base for the Chinese Eastern Railway spanning Manchuria, the city was developed by Russian Jews escaping persecution and later populated by White Russians - those who supported the anti-communist movement - fleeing a civil war back home. Over the years, Harbin also attracted nationals from more than 30 countries, especially those in the West, drawn by its burgeoning trade and development. The result is an Asian city with a uniquely European flavour. 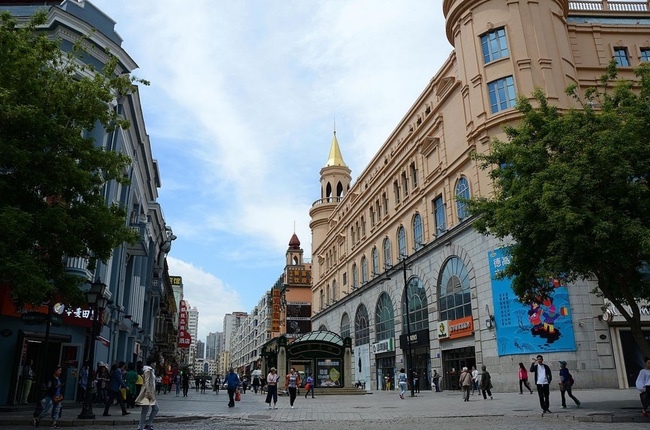 In fact, you can almost imagine you are in Europe along Zhongyang Dajie, a 1km-long, pedestrian-only street featuring broad pavements, shady trees, cobblestones and grey brick buildings harking back to the 1920s and 1930s. While most of these buildings are now home to sports stores, supermarkets, fast-food eateries, restaurants and souvenir shops, many of them once functioned as banks, offices and embassies - a fact revealed by small plaques found on most of their facades. Numerous "Russian" shops line the street, selling token Russian dolls alongside Li Ning-branded sportsgear. Over at the city's most famous landmark, St Sophia Cathedral, you could even fool yourself into thinking for a moment that you are right in the middle of Moscow's Red Square, with the 80-year-old Orthodox church's dome-shaped roofs towering over you. While most of its original interior is long gone - a victim of the Cultural Revolution - the building itself has been well restored and, today, houses an architectural art gallery. More glimpses of Harbin's history can be seen at the New Jewish Synagogue, where a museum showcases the contributions of Harbin's pioneer Jews to the city. Not surprisingly, Harbin has sometimes been called "Oriental Moscow". The food, too, is heavily Russian-influenced. Apart from the ubiquitous mala hotpots and spicy grills sold in just about every other eatery, you can try the Harbin-style smoked sausage that is more like the European sausage than the local lap cheong. Over at Sun Island, Harbin's answer to Sentosa across the Songhua River, the European vibe continues in a small "Russian town" and lets you get a glimpse of what old Russian homes once looked like. But the bigger attraction is the sprawling park dominating the island, where you can spend a day walking around several lakes and a man-made waterfall, feeding deer, snapping photos of blooming flowers and posing with concrete versions of winning ice sculptures from past years' winter festivals. For the kids, there is also a "Naive Bear Paradise" theme park, complete with a roller coaster, bumper car ride and carousel. The best part, of course, is that you can take all this in relative quiet, at least for a Chinese city of five million. Without the usual ice-festival crowds, there is enough space for a leisurely walk on many of Harbin's sprawling squares and streets in summer, as long as you avoid the school holiday periods from July to August. Not to mention unencumbered by freezing temperatures and heavy winter clothing. A warm summer holiday in Harbin? Think of it as a cool getaway. •The writer, a former Straits Times journalist, is an editor for a Christian publisher. Scoot flies direct from Singapore to Harbin. Check with the airline for the schedule as it changes depending on the season. Fares start at about $350. •Money: Get your yuan in Singapore as changing money in Harbin can be a hassle. Be prepared, however, if your cash and credit cards are not welcome. Most locals use mobile pay apps like Alipay or Wechat to pay for just about everything - from ice cream to a taxi ride. •Accommodation: Consider staying near Zhongyang Dajie. It is a great place to eat, shop or just walk down in the day and in the evenings. Harbin has a wide range of hotels, from budget to boutique to luxury. •Weather: Be prepared for sudden changes in weather, strong winds and rain. Temperatures can fluctuate significantly, from 15 to 35 deg C, in a matter of days. •Best time to go: It gets warmer in June, but it is best to avoid July/August, when schools close.